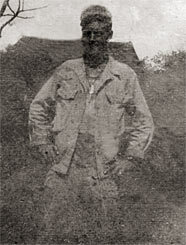 William R. Watson, (shown as a T/5 with the 1st Cavalry Division prior to Alamo Scouts selection), was a graduate of the 2nd ASTC class and was retained on REYNOLD’s Team. 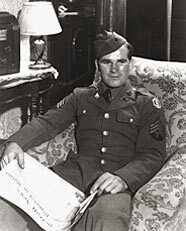 After the team broke up, Watson joined THOMPSON Team and performed numerous missions before receiving a team of his own in July 1945. A photo of William R. Watson at home in Michigan while a member of the VIII Corps. 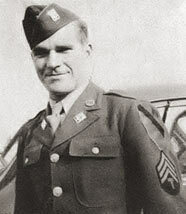 William R. Watson as a member of the 1st Infantry Division. 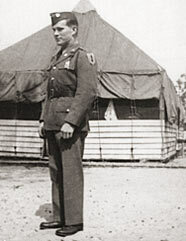 PVT Veldon R. Grasmick, a graduate of the 2nd ASTC class, is shown while serving with the 24th Infantry Division prior to volunteering for the Alamo Scouts. 1943. 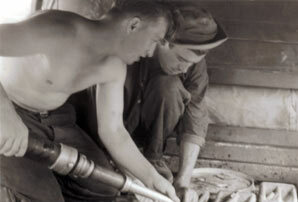 PVT Veldon Grasmick (wearing hat) is shown filling “jerry cans” with gasoline during the Louisiana Maneuvers, September 1941. SGT Orcutt W. "Jack" Frost, pictured in Kyoto, Japan, 1945. 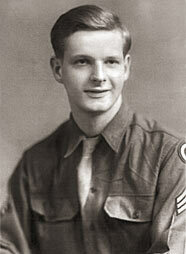 Frost was a clerk typist for CPT Lewis Hochstrasser and MAJ Gibson Niles of the ASTC. He joined the Alamo Scouts at Subic Bay on Luzon, then accompanied them to Japan, where he worked in intelligence until coming home in early 1946. Frost enjoyed a distinguished academic career, serving as Professor of Humanities and Academic Dean at Alaska Methodist University. Also, he has authored and translated several acclaimed books on Russian history. CPT Robert Borg (right) presents a check to LTC John Dawson of the Fort Riley Post Quartermaster's Office for the Dressage horse, "Bill Biddle." 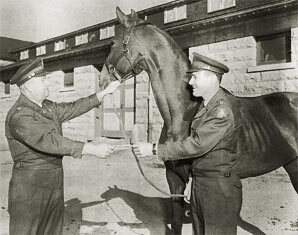 Borg, a graduate of the ASTC, rode the mount in the 1952 and 1956 Olympic Games and purchased the horse from the Army. 17 February 1954. SGT Rufo V. Vaquilar was a member of NELLIST Team and served with the Alamo Scouts from August 1944 until he returned home in December 1945. Vaquilar was born in the Philippines and came to the U.S. in 1925. At 34, he was the oldest graduate of the ASTC to be selected to serve on an operational team. 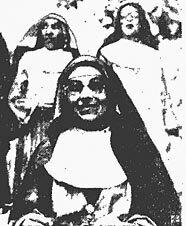 Sister Siglinde (foreground) was one of 100 missionaries rescued by U.S. Forces following the invasion of Hollandia, Dutch New Guinea, in April 1944. After learning of the missionaries from a native, SOMBAR Team slogged through six miles of knee deep mud to reach them. They had been in the jungle under the Japanese for more than two years. 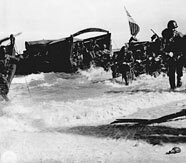 The Scouts returned to Hollekang beach with some of the missionaries then called for conventional units to help evacuate the remainder. The mission was the FIRST recovery of allied prisoners in the Pacific. The group consisted of 70 Dutch, 13 Americans, 3 Poles, 1 Czech, 1 Australian, and 13 German missionaries. Former Alamo Scout Robert W. Teeples. 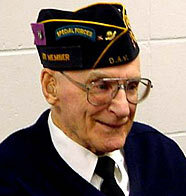 On 15 March 2006, Teeples was inducted into the Veteran's Administration Hall of Heroes for his service in New Guinea and the Philippines.Teeples earned the Silver Star in New Guinea and was awarded a battlefield commission on Luzon. 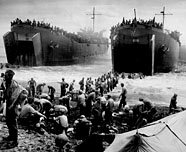 U.S. Navy LSTs being unloaded during the landing at Tacloban, Leyte, P.I., on 22 Oct 1944. Landing beach on Leyte, 22 Oct 1944. Alamo Scout teams were somewhere among the thousands of invasion troops. LSTs deliver men and equipment to Tacloban Beach 1, 22 Oct 1944. U.S. Forces en route to Lingayen Gulf and the invasion of Luzon. 9 Jan 1945. Happy Filipino civilians rush to great Americans upon landing at Lingayen Gulf. The Japanese chose not to defend the beaches, but to fight a delaying action in the rugged mountains of northern Luzon. The Alamo Scouts performed their most extensive and critical work during the Luzon Campaign. Tanamerah Bay, Hollandia, Dutch New Guinea. 22 Apr 1944. THOMPSON Team conducted a mission there from 22-25 Apr 1944. Landing force approaches Cape Sansapor. THOMPSON, DOVE, and LUTZ Teams conducted extensive reconnaissance of the area prior to the invasion. 30 July 1944. Painting of the Battle of Surigao Straits. NELLIST and ROUNSAVILLE Teams (along with team leader John Dove) were returning from a mission on Mindanao aboard two PT boats (Sea Bat & Green Harlot) when they were caught in the middle of the battle and bombed and strafed by enemy planes. Two sailors were killed and ten were wounded, including Alamo Scouts John Dove, Andy Smith, and Bob Asis. 27 Oct 1944.